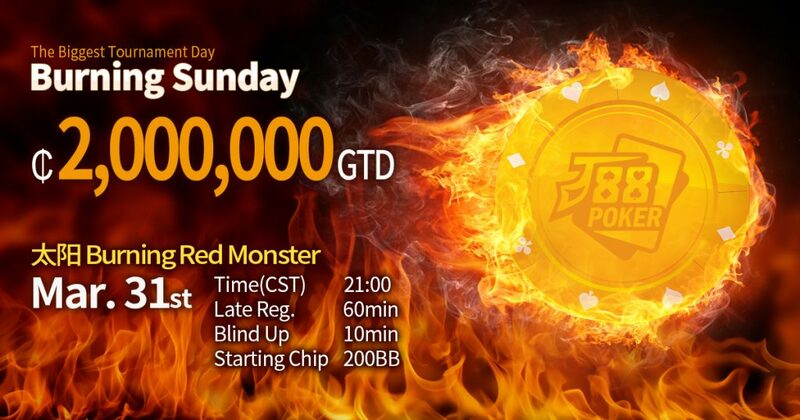 J88Poker 17th Burning Sunday on March 31st! 31st of March is the biggest tournament day of J88Poker! It is called “Burning Sunday” which is reserved for the last Sunday of every month. “Red Hot” tournament that is loved by players the most has a prize of ₵2,000,000 GTD and will be held at 9:00 PM(CTS). And don’t forget that the buy-in of ‘Red Monster’ is only ₵8,800!! Please have in mind that J88Poker does support multi table play! Simultaneous play up to 16 tables in PC and 4 tables in Mobile, so you don’t have to worry about opting any tournaments out! Register now, and don’t miss the chance of the biggest guaranteed tournament!